The Friendly Foreclosure strategy brings homeowners and property investors together BEFORE a foreclosure auction. Instead of an ugly eviction and costly renovation – this innovative solution can provide spectacular returns to real estate investors AND keep the former homeowners in their homes when all other options have failed. 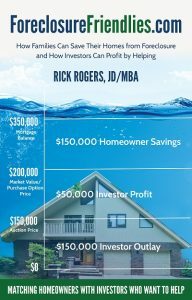 Some years ago, after conventional defense methods failed to save a client’s home, Rick Rogers crafted the Friendly Foreclosure strategy. Since then he has been using that strategy to attract investors to help financially qualified homeowners keep their homes. His new book publicizes the spectacular success the strategy can bring to homeowners and investors, in an otherwise ugly process. With real-life examples, detailed financial analysis, and step-by-step recommendations, Rick shows homeowners and investors how to utilize the strategy for their mutual maximum benefit. Over the last 10 years, my law firm has kept thousands of families in their homes and helped them escape foreclosure. Several years ago, I started working on a "when all else fails" strategy whereby we would find an investor to team up with our homeowner before the foreclosure auction. After agreeing to terms, the investor would hopefully be the winning bidder at the auction and then rent the property back to our homeowner with an option to purchase. When the investor won at the auction – this strategy turned out to be a spectacular success and brought significant benefit to both parties. After several years, I decided to write a book to both publicize and educate others about the strategy. We've never had a problem finding investors but it has proved much more difficult to put this opportunity into the hands of homeowners. With that end in mind, I am in the process of launching a subscription-based website to "match" homeowners with friendly investors. Hopefully, we can reach more homeowners, and more families will be able to keep their homes! When a property is sold at a conventional foreclosure auction, investors bid sight unseen, with hopes to buy it at a significant discount. The winning investor will be the new owner of a property, likely occupied by a family who doesn't want to leave, is very upset about losing their home, and has no obligation to maintain the property or pay rent while they continue to live there. The investor faces the ugly task of evicting the family, and the family faces the ugly task of packing up and getting out. A Friendly Foreclosure is different—the investor and the homeowner are on the same team. They're friendly! The Friendly Homeowners, or Friendlies, get to stay in their home after the auction at an affordable monthly rent, with the option to purchase their home back in the future for less than what they owed to their mortgage lender before the foreclosure auction. The Friendly Investor, or Investor, buys a cash flow positive property, at a significant discount, avoids the eviction process and expenses for repairs, maintenance, and marketing for resale, and ends up with a greater Return on Investment “ROI” in the end! Foreclosure Flips provide exceptional profits. Foreclosure Holds offer a longer-term wealth building program with an immediate net worth boost. At the Friendly Foreclosure auction, the Investor will bid and hopefully win. If successful, the Friendly will become a tenant and lease the home from the Investor under a pre-agreed, affordable rental lease. The Lease will usually be one to three years and will include a Purchase Option, whereby the Friendlies may purchase the property back at any time during the lease term at a pre-arranged price based on the finished market value. That Purchase Option price will be significantly less than the amount the Friendly previously owed on the home and more than the investor bid at the auction. The rent will typically be less than the former mortgage payment which provides savings to the Friendly while covering costs and providing some immediate revenue for the Investor. The Friendly and the Investor sign the Lease and Purchase Option before the auction. However, there should be no deposits or any exchange of money between Friendly and Investor before the auction. The Friendly should NOT pay any money to the Investor before the auction! If the Investor is the successful bidder, the lease both parties already signed will be in effect the day after the auction. If the Investor loses at the auction, the Lease and Purchase Option will be null and void, and the Friendly and the Investor will be financially no better or worse off than if they had done nothing. So, winning can be spectacular, and losing would be "as if you did nothing at all." Not much of a gamble. This strategy changes the foreclosure auction from a final nail in the foreclosure coffin to an opportunity for financial redemption for the homeowner. The Friendly Foreclosure strategy is successful because the Friendly is not just any homeowner in foreclosure, but specifically, a formerly financially distressed, now a fully or partially financially recovered homeowner in foreclosure. Friendlies have a strong desire to keep their home and the financial capability to do so but have exhausted all other possible avenues of escape from foreclosure. As an Investor, you really do have the power to give families an escape from foreclosure and the optimal solution to the devastating loss of their home. That’s a miracle to them! An Illinois woman bought her home in 2006, at the height of the market, for $300,000. In 2007, she lost her job. By 2009, she had been rejected three times for loan modification applications, the mortgage was 12 months behind, and the lender had filed a foreclosure case against her. • Including attorney fees and court costs added to her mortgage, past due payments, late fees, and penalties, she then owed $350,000 on her mortgage. With the market crash, her home was now worth $200,000. • After six months of unemployment, she was working again but didn't have the funds necessary to reinstate her mortgage. • Because the lender had a history of bidding 75% of market value, or less, at foreclosure auctions, there was a good chance this property could be purchased for $150,000 or less at the auction. • A Friendly Investor was identified and purchased the home for $150,000 at the auction. • The former owner, or Friendly, leased the home from the Investor for one year at a rent lower than her prior mortgage payment, but which provided a 10% ROI to the investor. • One year after the auction, the Friendly repurchased her home from the Investor for $200,000. After a down-payment of $6,000, she owed $194,000 on her new, affordable mortgage rather than the $350,000 she owed before the home was sold at a foreclosure auction. • The repurchase provided $50,000 of gross profit upon sale to the Investor, a 33% ROI in addition to the 10% rent return for the Investor. Not too shabby! • The foreclosing lender also made out nicely here, as it recovered $150,000 from the auction. Generally, the foreclosing lender recovers less than 50% of the fair market value, which would be less than $100,000 in this case, and on average it takes lenders a year after the auction to do so. The above is a common story about how people end up in foreclosure, with homes that are "upside down" or "underwater," meaning they owe more than the home is worth. The Foreclosure Friendly strategy is designed to assist Friendlies with similar circumstances. The following chapters will explain the steps of this strategy in greater detail.